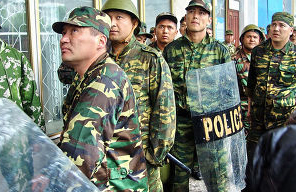 The situation in Kyrgyzstan and the capital Bishkek is extremely fluid and unclear but one thing can be said for sure and that is that the regime of the recently ousted Kurmanbek Bakiyev, from the moment it took power in March 2005 gradually transformed itself into a rigid dictatorship. The 2005 uprising, the so called Tulip Revolution, was more akin to the pro American colour revolutions in Georgia and Ukraine, but this time it appears that the wheel has turned full circle in Bishkek. What fundamental liberties that existed in the political and social life of the previous President Askar Akayev slowly disappeared under Bakiyev, the media that was “out of line” or independent was censored and then closed down, many members of the opposition were kept silent either through threats or killings, At the same time, the national institutions were put into the hands of family members of the president, the Parliament was reduced to just a group of obedient rubber stamping officials and the local authorities turned into docile agents for the president, his family and his clan. By Central Asian standards, the previous government of Kyrgyzstan from 1991 to 2005 was – admittedly with its many failings and contradictions, was initially an example of liberty and democracy that slowly started to become politically more and more like its immediate neighbours in the region: Uzbekistan, Tajikistan and Kazakhstan. A process that was no doubt helped along from the outside as in the early years, ferocious dictators such as the Uzbek Islam Karimov had complained about the presence of an “anomaly” in the region which he considered to be a threat inasmuch as it was welcoming political exiles from its neighbouring countries. This transformation from a democracy (albeit sui generis) to a dictatorship also created a heavy economic burden which inevitably was paid for by the “weak” majority of the population. In a country that is basically without any natural resources, less liberty and less democracy this translates into less business and fewer foreigners. A reasonably well developed and flourishing media sector was crushed, there were no longer any international conferences and meetings and corruption had spread to all sectors of the economy. The only resources that Bakiyev could make use of were the military bases offered to the USA and Russia in exchange for money that no doubt did not end up being used for the public good. Even remittances sent home from immigrants in Russia and China, which until 2008 were a significant part of GNP, collapsed with the global recession. A rise in prices for utilities is said to be at the heart of the revolt. This may well have been enough to trigger this uprising, but it is too early to tell if there are other factors at work such as clan rivalry, or religious tensions. “A coup d’etat with foreign interference” is how Kurmanbek Bakiyev, the deposed President (but still officially in power), described the events of the last few days which, after violent attacks on the streets of Bishkek, has brought the opposition to power. Bakiyev, who spoke on the phone to a Moscow radio station, did not accuse any country in particular, just saying that “it would have been impossible to organise all this without help from a foreign power”. Vladimir Putin was the only foreign leader, who even during the bloody riots of Wednesday afternoon around and inside the state buildings, stated outright “we are not involved”. Putin had already had a telephone conversation with the self proclaimed Kyrgyz leader Roza Otunbayeva, a former foreign minister, that same evening, thus seemingly offering a de facto recognition of the opposition’s authority. The new Kyrgyz government had openly asked for the “fraternal assistance” of Russia and has announced the imminent departure of a delegation to Moscow. At the time it seemed clear that the foreign power that Bakiyev was referring to was Russia but Bakiyev later stated that neither Russia nor the USA were involved in the coup. President Bakiyev actually left the capital Bishkek last Wednesday evening, to take refuge near the city of Dzhalal-Abad (in the south) from where, (all the while admitting that he no longer had control of the police or army and that he could not control events in the capital), he refused to resign so as to formally pave the way for his adversaries to take power. Instead, he issued what was tantamount to a challenge: “Come and get me, if you can, otherwise, sooner or later, I will be back”. This was not an empty challenge, in her first press conference, Roza Otunbayeva (it is interesting to note that this is the first time that a woman has taken power as a result of a violent uprising) admitted that the provisional government only had control of 4 out of 7 regions. There have been reports that groups faithful not particularly to Bakiyev but to his Minister of the Interior, Kongantiyev, who was injured and taken prisoner by the demonstrators during the uprising on Tuesday in Talas, have blocked the country’s main road which links the capital to the city of Osh in the south and are demanding the Minister’s return. Order has not yet returned to Bishkek. Fighting and looting are still going on, almost everywhere, so much so that the new Minister of the Interior has given the order to shoot looters. Civilian militiamen organised by the opposition, (now in power) are confronting other groups of armed men, it is unclear if they are just looters or supporters of the toppled government. The hot spots of the uprising have been around the Mayor’s office in the capital, and the office of the telephone company. These two buildings had not yet been sacked (by Wednesday) and the police was guarding both buildings from large groups of young men who were determined to get inside. Other groups of looters were trying to gain entrance to the areas where most of the foreign embassies are situated. It is still unclear if they managed to gain access or not. Roza Otunbayeva has announced that Parliament will be dissolved and new elections will be called within six months, both parliamentary and presidential. She stated in a press conference: “We are doing this because the Kyrgyz people are tired of corruption and abuses of power”. Moscow has sent two platoons of paratroopers over to Bishkek but they will remain on the Russian air base at Kant. They are ready to defend Russian citizens in the capital and perhaps to dissuade anyone from trying to overturn the new opposition government. Both the Russians and and the Americans appear to be quite calm about the situation, it has already been announced that their respective military bases are under no threat. Despite these reassurances, the Americans initially suspended flights from their Manas base in the north, keeping their troops on alert but flights have now resumed. The Americans did send in another flight to the main civilian airport that was carrying supplies for the Bishkek hospital so that the many injured in the uprising could be treated. Barack Obama and Dmitri Medvedev who were recently in Prague to sign the Start 2 Treaty both declared that they have a common interest in the country and that they might issue a joint statement on the matter. Initially there were reports that the uprising might in some way be a proxy war between the US and Russia although that does not seem to be the case.